Made with Sunbrella®, the best outdoor fabric available. Polyester fiberfill cushion interior. Combined with a sturdy polyester rope harness and hand finished white oak spreader bars. 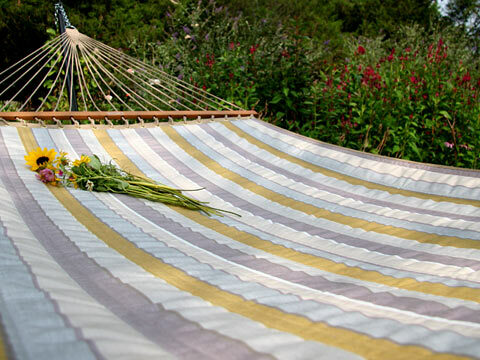 Our most durable and beautiful outdoor hammock. Ready to hang under the shade of two trees, between posts, or mounted on a sturdy Twin Oaks Hammock Stand. 82 in. x 52 in. bed. Overall length approx. 13 ft.